1976. The Shuttle Enterprise, about to embark on a continuing mission to test in-atmosphere flight, and never quite get into space. The shuttle's rollout ceremony with most of the main cast from Star Trek was neither the first or last collaboration between NASA and Star Trek. 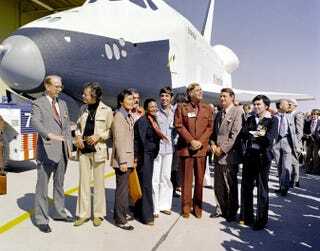 From left to right, that's James Fletcher (NASA administrator), DeForest Kelley (Dr. "Bones" McCoy), George Takei (Mr. Sulu), James Doohan (Chief Engineer "Scotty"), Nichelle Nichols (Lt. Uhura), Leonard Nimoy (Mr. Spock), Gene Roddenberry (Star Trek's creator), Geoge Low (NASA deputy administrator), and Water Koenig (Mr. Chekov). The shuttle earned its name partly due to a fan write-in campaign, an impressive feat in the dates before the internet made coordination simpler. The prototype shuttle served as a full-scale flight-test vehicle on how to use winged craft for spaceflight. Built without functional engines or a heat shield, the Shuttle Enterprise never went into orbit. Instead, it was the first craft in the Approach and Landing Test program, and was essential for development of the reusable shuttle program. The Enterprise was carried high into the atmosphere by a modified Boeing 747 (the creatively-named Shuttle Carrier Aircraft). Once the shuttle was released, the vehicles would drift apart, taking about 1.5 seconds for the shuttle to lift and the 747 to descend. This is when the real test portion of the flights began, checking out the shuttle's aerodynamic flight control systems and subsonic handling characteristic during the free flight (without main engines, it was more of a controlled free-fall) back to Earth. The pointy tail-covering over the engine ports was used to improve aerodynamics of the shuttle while it was lifted into orbit, and during the first three free(-fall) flights. After that, it was removed and three dummy main engines were installed to simulate the weight and aerodynamics of an operational orbiter during reentry. On the very last test-flight, after previously landing on Rogers Dry Lake, the shuttle landed on the runway at Edwards Airforce Base. This proved that precision landing with the shuttles was possible, while simultaneously revealing problems with pilot-induced oscillation leading to the Enterprise skipping and bouncing before coming to a stop. A software filter was developed for the fly-by-wire flight controls, resolving the issue prior to the first shuttle launches in 1981. The Enterprise is now on permanent display at the Intrepid Sea, Air, & Space Museum in New York. Getting back to Star Trek, Lieutenant Uhura's service on the bridge of the starship Enterprise, and her actress Nichelle Nichols' active questioning of why Star Trek's diversity wasn't reflected in American society, hit a chord with NASA's officials. After a speech in DC where Nichols pointed out that repeated failures to accept qualified applicants was disenfranchising women and people of colour from even applying, NASA enlisted Nichols' aid to reverse the trend. Through her efforts to expand diversity, the first women and people of colour were recruited to NASA's astronaut core in the 1970s. Her recruits included Ronald Ronald McNair, Frederick Gregory, Judith Resnick, Sally Ride (first American woman in space), Charlie Bolden (current NASA Administrator), and Mae Jemison (first African-American woman in space). Jemison took her inspiration from Nichols' portrayal of Lieutenant Uhura one step further by becoming the first NASA astronaut to appear in a Star Trek episode (in Star Trek: the Next Generation, "Second Chances" as Lt. Palmer). Nichols' contributions to NASA were celebrated at the Goddard Space Flight Center in 2012. Although not recruited in an official capacity, George Takei has previously toured Goddard. During his visit in 2008, he made a speech linking the diversity he saw in the modern space agency an encouraging reflection of the multinational USS Enterprise. He, like Nichol, is an ongoing promoter of space exploration in his innumerable public appearances, and believes in the ability of entertainment to inspire people to seek out careers in science, technology, engineering, and mathematics. Proving Takei right, the staff at Goddard were eager to give him the "Live long and prosper" salutes used by Vulcans in Star Trek. In the press release, Dr. Kevin Bock, then system lead for camera repairs on the Hubble Space Telescope, giddily exclaimed, "I was floored by his energy and interest in what we do. Lots of us grew up with Star Trek; it's in our minds when we're doing all this." Hat-tip to the NASA History Office twitter account (@NASAhistory) for the blast-from-the-past. For additional history on the Shuttle Enterprise, check out its test flight history, or read about the NASA shuttle program. All images credit NASA.